Obesity is a prominent risk factor for type 2 diabetes. Management of type 2 diabetes requires weight management in addition to glycemic parameters. For obese type 2 diabetes patients, metformin, Sodium-glucose co-transporter-2 inhibitors or Glucagon-Like Peptide-1 Receptor Agonists should be prescribed as the first priority for controlling both hyperglycemia and body weight or fat distribution. The combination of these drugs with sulfonylureas, thiazolidinediones, and insulin may also be required in chronic cases. These drugs cause weight gain. Fortunately, many phytochemicals having a beneficial effect on diabetes and obesity, have minimum side-effects as compared to synthetic drugs. 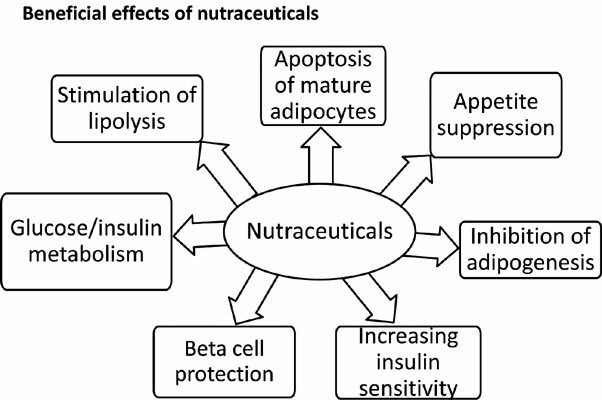 This review discusses the treatment strategies for controlling glycemia and weight management, with the focus on anti-diabetic drugs and phytochemicals. Glucagonostatic role, activation of Adenosine monophosphate-activated protein kinase and adipocyte targeting potential of anti-diabetic drugs and phytochemicals are also discussed. Obesity, flavonoids, diabetes, curcumin, bioactivity, pharmacotherapy, diabesity.